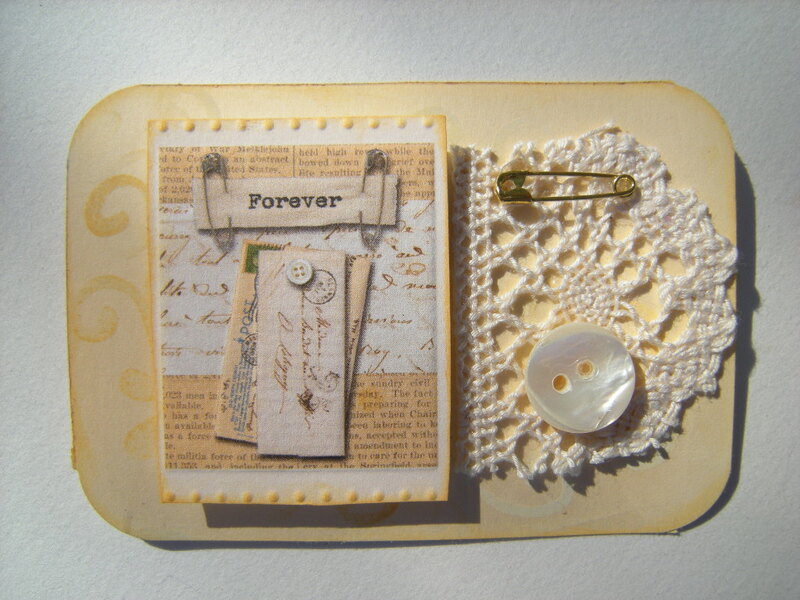 In the (Artist’s Trading Cards) ATC Swap Group this month, our theme was “A Paler Shade of White”. Why, yes, its a spin off from the song, “A Whiter Shade of Pale“. So Retro- Vintage here! Check out the outfits in this video! Our group seems to enjoy the color themes, many of us, including myself, liked the idea of white this time around and yet struggled to incorporate that idea into our art. What I had in my mind was that vintage white you get when its been around a while and started to yellow, and that pearl white of old shirt buttons. I took me longer to gather materials than it took me to make the cards. 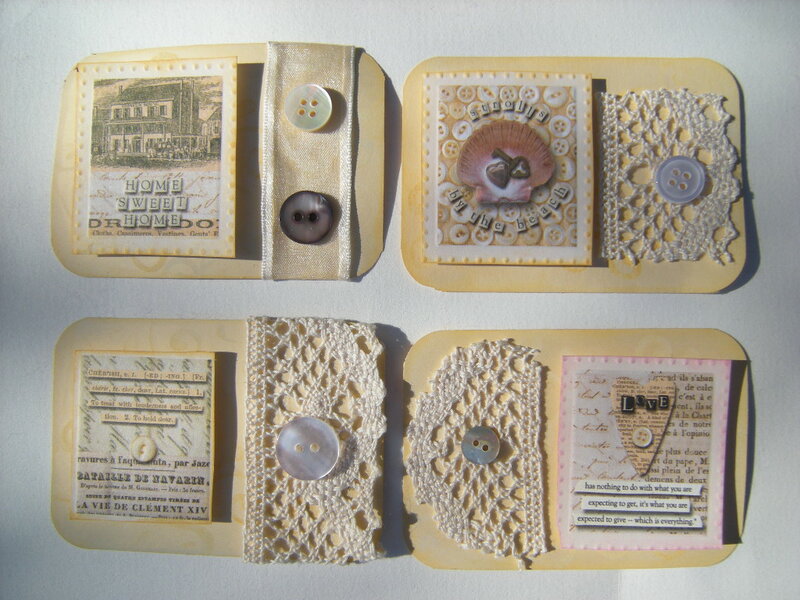 They were sewn onto the card, and I had to rip them off, which left these trailing bits of yellowing thread, perfect! I used as they were, and liked the look. What do you think? 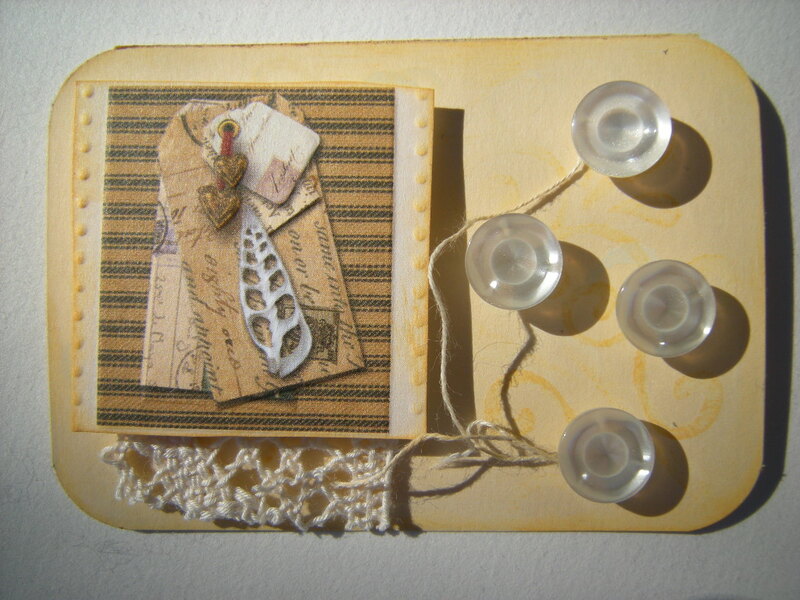 In this one, I love that I was able to mirror the pearl button and tiny safety pin in the picture. 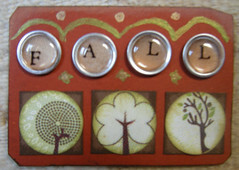 The very latest for my ATC Swap group. I wrote Chinese proverbs and used stamps, walnut distress ink, chalk inks, Basic Grey card stock, Carson paper, Bazzil card stock, corner rounder, Making Memories brads, foam pop ups, and a white jelly roll. Tags: Asian themed, ATC's, Chinese proverbs, Oriental themed. 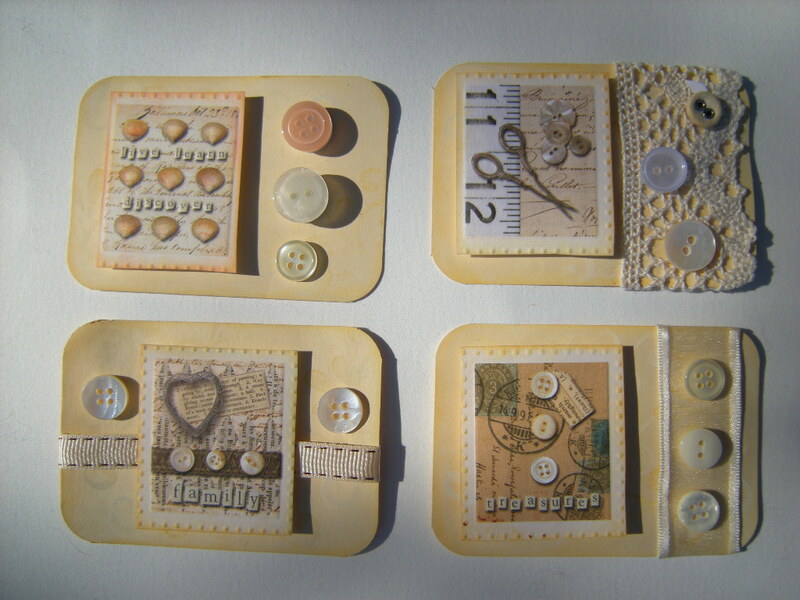 While Dexter snoozes away…I am busy making up a batch of Winter Time Themed ATC’s. 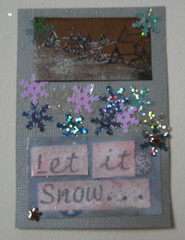 Since it is snowing like mad this week, I made a few snow themed ATC’s. Oh, and I printed the “let it snow…” on my graphics program. 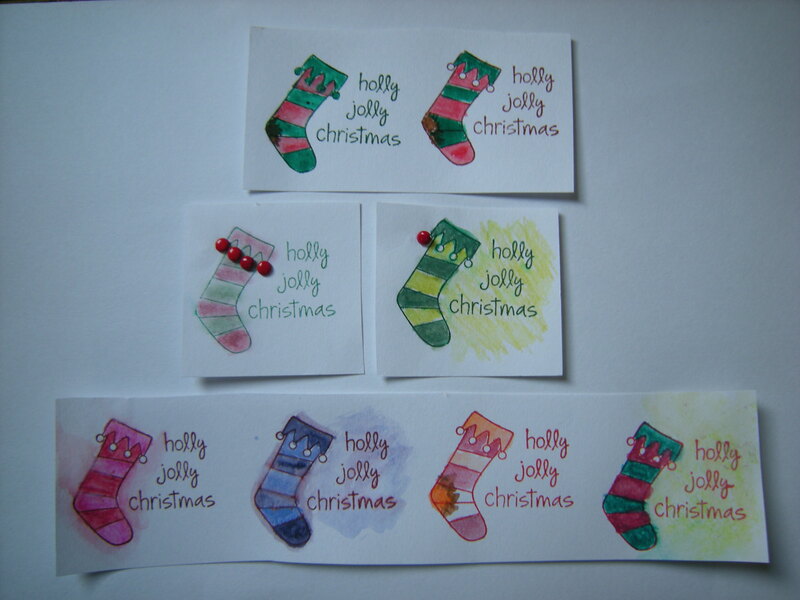 After that, I added some more card stock, chalked and/or inked the edges and used 3-d glue dots to stick my Christmas inchies on there. I spent some time preparing the Inchies in advance, so I could have a number of them ready to go. Some of the Media used: Bazzil & Colormates cardstock, assorted scrapbook papers, clear & satin pearl embossing powders, mixed snowflakes, snowflake brads,mini red brads, mica bits, staz on black ink, silver color box ink, silver gel pen, alene glue, stamps, clear & antique glazes, Pearl-Ex pigments, watercolor pencils and crayons, chalks, fine glitter, ribbon, winter themed stamp sets. 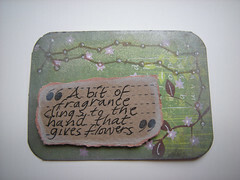 Media used: White cardstock, Sepia, Raspberry & Pine Inks, chalks, watercolor pencils & crayons, watercolor paints & brads. What am I going to do with all these? 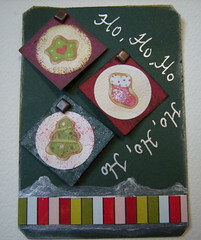 Good question, they will be cut up and used in Christmas Cards and Winter Time Themed ATC’s. And Have a Holly Jolly Time! 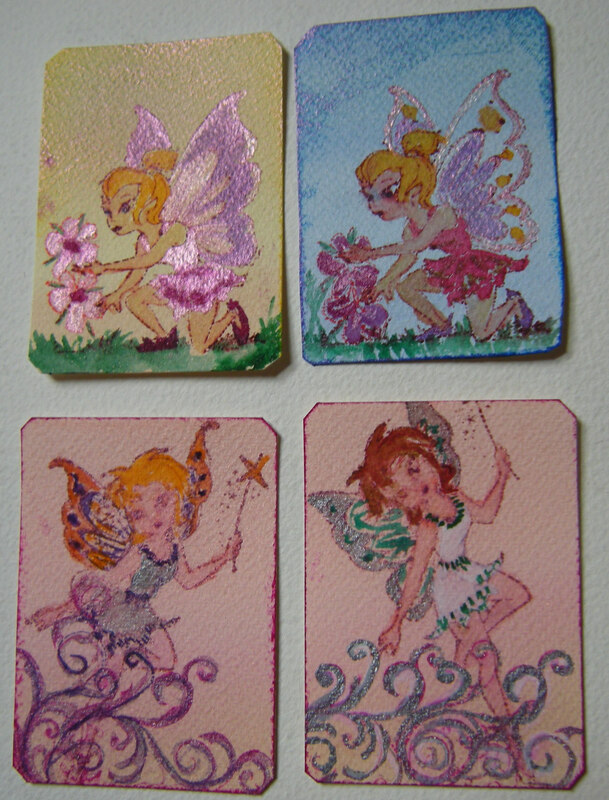 More of the November Theme Fairy cards. Ok, so as you can see, I painted these little fairies on a toadstool with a very fine brush. My script brush, actually. And I am just about ready to get me one of those magnify-ing light thingies. Man, I just can’t see little stuff like I used to. Watercolor paints, red interference pearl-ex and antique silver pearl ex, stamps, ink, brush markers and clear glaze used on all these cards. 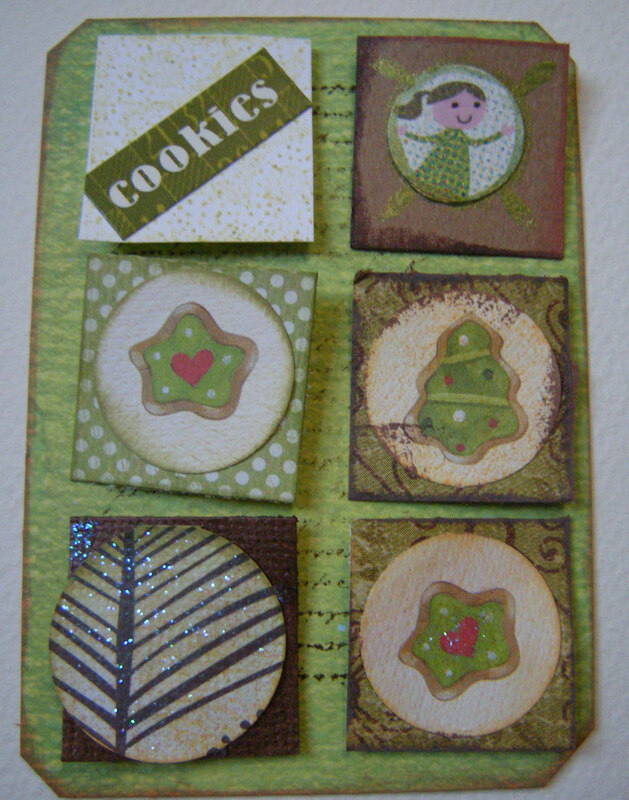 The Theme for November’s ATC Swap was Fairies. As in Fairy Tale Fairies, what were you thinking? anyways, after I did about nine Fairy cards, I started hearing “Tiny Bubbles” song playing in my head…so there you go. The background of the bubbles is courtesy of my five year old niece, Sarah, when I had out the watercolor paint and watercolor “crayons” for her to play with. I cut up the water color paper and figured I would use it sometime….and I did. 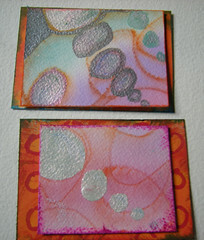 Aside from using my watercolors, I was also trying the new-to-me Pearl Ex-Pigments to make the bubbles. I have to say Pearl Ex-Pigments are very versatile, there are many ways to use them, and if you know me at all, you know that I love versatility! Just on these two cards I used them in several different ways. The antique silver pigment I mixed up with water and arabic gum powder which I keep in a small sealed container, this keeps it moist. On the pinkish color (interference red) I did the same mix, but kept it in a shallow dish in the open air and allowed to dry as a cake of paint would. I also tried mixing in different watercolors to add color, I added purple to the dish and blue directly to the paint already on the paper. Chris picked this one as his favorite. I was going for the “hanging the stockings with care” look with this one and I like the sense of movement it has. Here’s four I finished in various ways. 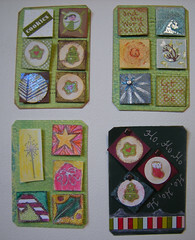 Stamped, punched, painted, stickers, embellished or drawn by hand, I try to make each one different. I asked Chris to pick his favorite Inchie and this is the one he likes. So, I am not mailing this one out. It will be kept here for us to admire. Unless you want to swap ATC’s with me too? Here an Inchie, there an Inchie, everywhere an Inchie inchie! 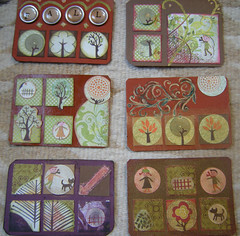 Next batch of Fall Inchies due to go out. 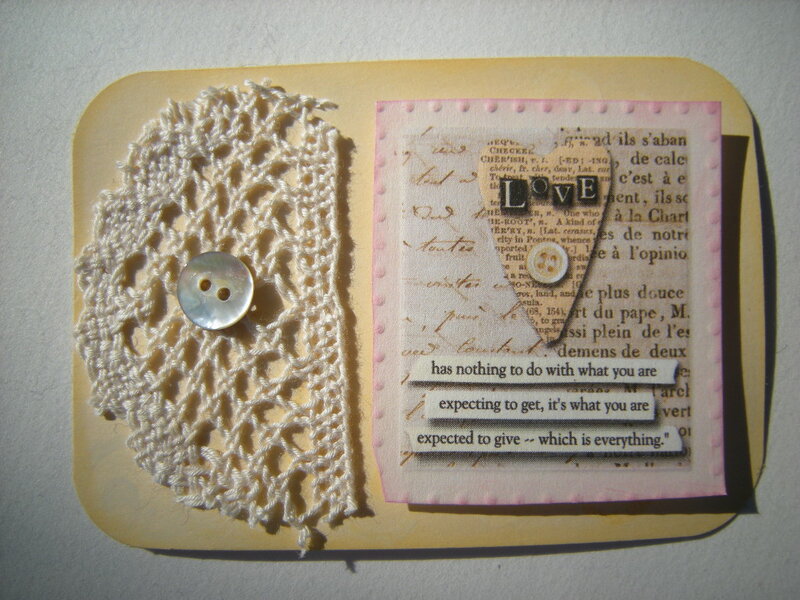 More playing with ways to arrange tiny little pieces of paper on a small piece of card stock.